Earn up to 1,432 reward points. Classic fuzz with modern features. 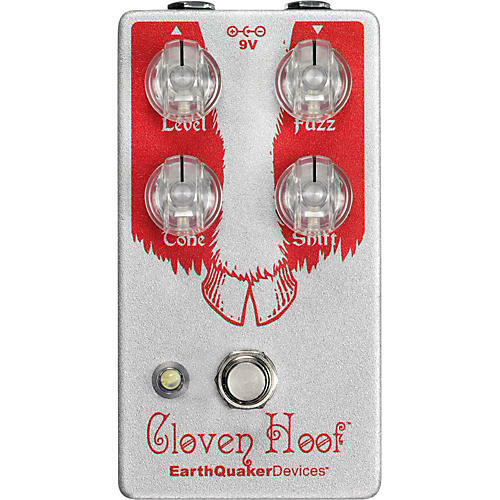 The Hoof is loosely based on the classic green Russian muff-style fuzz circuit, and features a hybrid Germanium / Silicon design, pairing maximum tone with a temperature stability not found in finicky and expensive vintage units. EarthQuaker hand-matches NOS Germanium transistors to exacting specifications for pedal-to-pedal consistency, taking the guesswork out of your fuzz purchase, and guaranteeing that your Hoof delivers the same smooth, natural, and harmonically rich sustain as all your friends’ Hoofs. The Hoof has a wide gain range, providing everything from dirty and organic amp-like overdrive, to monstrous fuzz madness. This, paired with the “Shift” control allows you total tonal access, as the “Shift” knob works with the “Tone” control to alter the overall frequency response of the Hoof. Use the “Shift” to boost the highs for a glassy, cutting top-end; use it to cut out some low- mid mud; use it to add some thick stoner rock sludge; use it on bass; use it to combat the muff-style fuzz’s notorious “mid scoop;” use it however you’d like, just use it! The Hoof’s distinctive, fuzzy character is tight and controlled without sacrificing any “guts,” so to speak, so even the gnarliest fuzz tones will sit well in the mix. The Hoof fuzz is all-analog and true bypass. Fuzz: Clockwise for heavy, counterclockwise for light. Tone: Bass to the left, Treble to the right. Level: Controls the output level. Shift: Adjust the mid content. Clockwise for classic scooped mids, counterclockwise for the more modern cutting mids all the kids love. Vintage fuzz without the temperature instability. Order today.